That’s right. 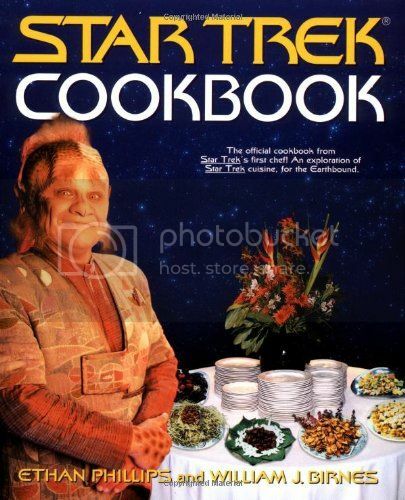 The Star Trek Cookbook. So what’s the featured recipe? NERD CAKES? Ha! Yeah. That happened. And I apologize. Not for mocking this lamebrained idea for a cookbook, but for the lazy joke. Sometimes the low-hanging fruit is the tastiest, you know? Seriously, though, folks… [waggles cigar] …given what I can see of the rather Plain Jane recipes on the cover, couldn’t this easily have just been called “Cookbook”? Try again, Star Trek nerds. @Pizza Girl: I think the creation of the book was predicated on the idea that Star Trek fans aren’t particularly discerning, and that they would wet themselves over anything that seemed made just for them, even on a surface level. And… they’re probably only 56% right. Agreed. I saw this in a bookstore. Got all excited! Flipped through. Got disappointed. Waste of paper. My friend has this book (and has had it for many many years), and I thought we made the Rokeg Blood Pie, and it was a big piece of meat in a red marinade…maybe it was Heart of Targ I’m thinking of. Anyway, the point is it was a decent recipe that was a lot of fun for my friends and I to put together for our Sci-fi party. Not saying it’s not goofy, but it’s no more silly than “Wookie Cookies”. “Star Trek’s first chef”, eh? I believe one Benjamin Sisko would disagree. Joseph Sisko, too. I wonder if the food tastes as bad as the photoshop makes it look. Blech.